It’s no fun being inside a house that’s either too warm or too cold, which is why thermostats have turned into an essential item for many homeowners. Of course, with thermostats becoming a ubiquitous item, it’s also become tougher to figure out which one will work best for you and your family. We will help you find the answer to that question in this article by putting up the Ecobee vs Nest. To be more specific, we will look at the Ecobee4 and the Nest Learning Thermostat to see if one of those products can edge out the other. Ecobee4 vs Nest Learning Thermostat: Which Should You Buy? After looking closer at the Ecobee4 and the Nest Learning Thermostat, differences between the two become apparent. 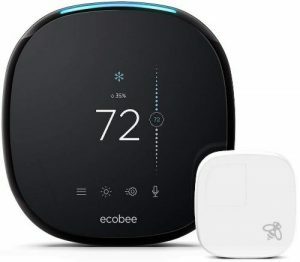 I want to be clear in saying that you really can’t go wrong with either product here, but if you value energy efficiency greater than a better interface or Alexa integration, then you should go for the Ecobee4. It can be argued that the Nest Learning Thermostat provides greater convenience, but the energy savings are more valuable to me personally. The Ecobee4 is all about making you feel comfortable in whichever room you’re using, and it does that with the aid of supplemental gadgets known as Room Sensors. To get the most out of these sensors, you have to place them inside the rooms of your home that you and your family occupy most frequently. The sensors will then check to see the temperature of the room and whether anyone’s in it. If the room is indeed occupied, then it will adjust the temperature to what you have deemed as a comfortable level, and if no one is inside the room also occupied by a sensor, then the temperature will be left alone to save you some money. You can also make use of this thermostats Follow Me feature to ensure that you can be comfortable wherever you go inside your home. You can actually find plenty of similarities between the Ecobee4 and the Ecobee 3, though the former has a more functional Alexa. That said, it doesn’t always work how you want it to. The Ecobee4 has trouble clearly interpreting what you say, especially if you’re not located nearby, and that can make the experience of using Alexa frustrating more than anything. Troublesome Alexa integration aside, you’re still getting a highly functional smart thermostat in the Ecobee4. Installation takes no time. As long as you follow the guide and walkthrough provided, you should be able to have this up and running within 30 minutes or an hour even if install thermostat is not something you have a ton of experience with. The sensors work great, particularly when compared to how the sensors of this device’s predecessor performed. The Ecobee smart thermostat will provide you with stats that will indicate how much money you are saving as well as other bits of information that you can use to improve your home’s overall efficiency. There’s no need for you to perform routine check-ups of this thermostat because it will be the one to tell you if something is wrong so that you can promptly address it. The designers could have done a better job with the user interface as it may be tough to read what it says every now and then. Because this device has its struggles with regards to interpreting what you are saying, the performance of Alexa can suffer. The key feature of the Nest Learning Thermostat is right there in its name – learning. You don’t want to spend time constantly fiddling with the thermostat to get it to work how you need it to, and the way that this Nest item does that for you is by picking up on your habits. The sensors of the Nest thermostat will tell the device itself about how cool or warm you want your home to be at different points in the day, and regular adjustments are going to be made based on those preferences. This newer device performs noticeably better than the Nest Thermostat E.
Chances are that if you liked that previous nest offering, then you will fall in love with this item as well. The Farsight feature helps make it so much easier for you to read the information on the display. It illuminates the display so that you can read everything you need to without having to walk over to where the thermostat is located. In the Ecobee 4 review above, we talked about the sometimes problematic display, so the Farsight feature definitely helps the Nest Learning Thermometer stand out. If you take the time to study the Nest Learning Thermostat closer, you’ll see that it tells you how your home can be more energy-efficient. You’ll have to change the temperature yourself, but at least you have something that tells you what you need to do. This is another thermostat that doesn’t trouble you with the installation process. That task can be completed in less than an hour if you follow the instructions. This thermostat doesn’t need a lot of time to learn your preferences. Within a week or so, it will interpret what you’ve been doing and make the necessary adjustments. The addition of the Farsight feature makes this smart thermostat more accessible. Alexa works really well with this thermostat and you should have no trouble getting it to carry out the tasks you need to be handled. To get the most out of this smart thermostat’s energy-saving features, you will have to make the adjustments yourself. It would be nice if that particular task was something this device could manage on its own. You can still save money on your energy bills with this item, but other smart thermostats can do better. Price will not be the deciding factor in the Ecobee4 vs Nest matchup because the reality is that many people will look at how much they cost and decide that the amount being asked for is way too much for a thermostat. Given that there are less expensive alternatives, some people may look at those as the wiser purchases even if they do lack some of the high-end features included in smart thermostats. In the long run, though, you can end up saving more money by investing in a smart thermostat now. According to the United States Department of Energy, homeowners can reduce their heating and cooling costs by 10 percent a year if they turn their thermostat back around 7°-10°F per day. During the summertime, homeowners can continue to save money by allowing their home to become warmer than normal when they are away. That is where smart thermostats come in as these devices are typically designed to help people cut back on their heating and cooling costs by making the appropriate adjustments when no one is inside the house. By simply relying on the information relayed to them by their sensors, smart thermostats can continue to keep your home energy-efficient even if you have to rush out of the door early in the morning. More than a few people will likely find the upfront investment needed for a smart thermostat to be a bit too steep, but in the long run, the value that will be provided by this device should more than make that price worth it. The clear winner of this Ecobee vs Nest matchup for me is the Ecobee4. 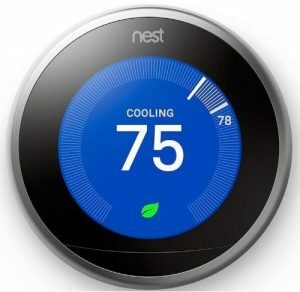 It’s easy to fall in love with the convenience provided to you by the Nest Learning Thermometer and the fact that it will study your preferences to serve you better is most certainly charming, but I still place greater importance on maximizing energy savings. If you want the more convenient option controlling the temperature inside your home, that is more than understandable. 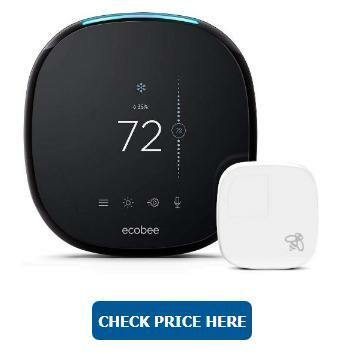 With prices for both items falling into the same range though, I simply believe that I am getting greater value from the Ecobee4, so I am choosing that thermostat.